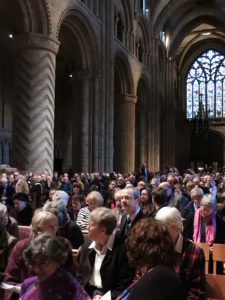 The nave of Durham’s majestic Cathedral was packed with the members and friends of St. Chad’s College on Sunday night. Chadsians past and present came from around the world to celebrate the formal installation of Dr. Margaret Masson as the College’s tenth Principal. 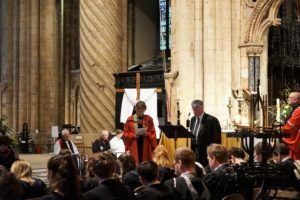 It was an incredibly poignant and moving service, heralding the beginning of a new chapter in the College’s history. Dr. Masson was appointed in March, and is the first woman in the College’s 112 year history to become Principal. She selected the hymns, readings and music to be used in this special service. The College Choir were in superb voice, accompanying all of the hymns, and began the service with a subtle and gentle Introit from John Rutter (God be in my Head), and closing the Service with a rousing rendition of Parry’s mighty Coronation anthem I Was Glad (a setting of Psalm 122). 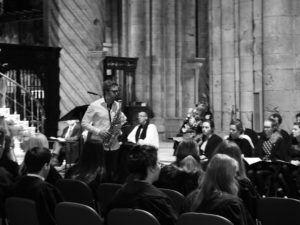 Talented trumpeter, and first year Economics student, Tom Rickard accompanied postgraduate Millie Lawrence with a moving recital of Handel’s Eternal Source of Light Divine; and former JCR Vice-President Jordan Smith (a Chad’s student from 2012 – 2015) returned to his spiritual home to play his saxophone. He chose to perform Vienna by Billy Joel, and introduced his piece by saying how it reflects upon our new Principal, and the College community as a whole. He said that Dr. Masson always finds the time to support Chad’s students in whatever they are doing, and that she embodied the Chad’s spirit of community, respect and looking out for one another. These sentiments were echoed by the sermon (which can be read here). 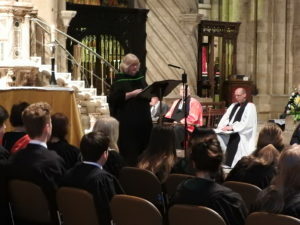 Delivered by the Baroness Sherlock (an Honorary Fellow of the College, and a close personal friend of Dr. Masson), she spoke about how our new Principal would “step up and lead a community of learning”. The theme of community – which all Chadsians hold dear – ran throughout the sermon. Lady Sherlock emphasised the way Dr. Masson will play a key role in helping all of its members flourish, develop, care for the wider world and become better citizens. 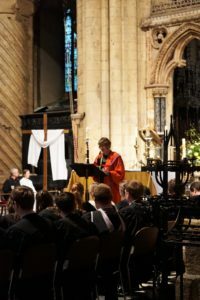 Her sermon epitomised the very ethos and vision of the College, and it was incredibly powerful. The formal installation process was led by Professor Jonathan Blackie, the Chairman of the Governing Body. He asked Dr. Masson to “affirm the mission of St. Chad’s College” and to “accept the commission to… lead the College community”. The poet Anne Stevenson read her work An Even Shorter History of Nearly Everything (for Bill Bryson) which was inspired by the Cathedral and the surrounding area; and Durham University’s African Drumming Society welcomed Dr. Masson to her post with an uplifting rendition of Kembo Alleluia by Ngoma Vuma Uropa. Following closing prayers and hymns, Dr. Masson led the procession out of Durham Cathedral to the soaring chords of Widor’s Toccata, brilliantly played by College Organist Dr. Peter Swift. The official celebration may have concluded, but the congregation descended upon St. Chad’s College’s Cassidy Quad and the specially built marquee to continue the celebration with refreshments. 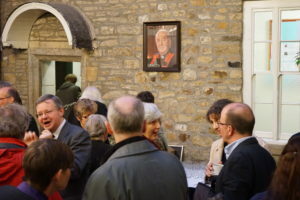 This informal party was a fantastic opportunity for old Chadsians to catch-up with their contemporaries and for the current generation of Chadsians to meet their predecessors. The evening was a great success, and a brilliant way to formally welcome Dr. Masson to the post of Principal. Everyone wishes Dr. Margaret Masson the best of luck for the future.